You'll be £8.00 closer to your next £10.00 credit when you purchase The Extraordinary Life of A A Milne. What's this? Generations of children have grown up loving the tales of Winnie The Pooh and his friends from the Hundred Acre Wood, which are still among the most popular – and profitable - fictional characters in the world. This book is definitely a page turner, I grew up with Winnie The Pooh so wanted to know more about the author, really found it hard to put down which surprised me as this isn't my usual kind of read, anyone wanting to read the history behind Winnie The Pooh will love this book. Anyone who has been curious about Winnie the Pooh's backstory -- or the life of a celebrated author between the wars -- will find this an engrossing book. This book was fascinating to find out about all that was going on behind the scenes. I love Winnie the Pooh and his crew and the stories, but I didn't realise how it was Daphne that seemed to play more with the toys than Christopher and all that went on with Alan and how he wanted to be known for his other writings as well. Definitely a fascinating read. This book truly is wonderful. I have enjoyed the Winnie the Pooh stories my entire life. They have been very important to me and my first books were this collection. When I had children of my own Winnie the Pooh was a big part of their life too. Reading this book gave me more information about the man and his family that wrote the stories. I always enjoy learning about the writer and their inspiration. The book was well written as well. Wow! I grew up reading A.A. Milne’s books and they were a great part of my childhood. It was really interesting to read about the author behind so many of my cherished books. It was nice to have a better understanding of A.A Milne and readers will find out things that they probably previously did not know. ...I loved this book and I’m sure you will too. What a superbly written insight into one of the world's best loved authors! We all best know Milne for his children’s books and for the legacy that is Winnie the Pooh. This book strips back his life, his work and his views on life. A really interesting read for all book fans. A fascinating tale of the author A. A. Milne, his writing, his family, and the time in which he lived. Milne was a mass of contradictions, both proud and hounded by the success of the Winnie the Pooh stories, close and yet ultimately estranged from his only son, and a pacifist who supported the second World War in several critical ways. This is a readable biography that had me returning to Milne’s works with curiosity and a lively interest. I appreciated Nadia Cohen’s extensive research, her way of writing Alan’s story and her insight into his interactions with his closest friends. I thoroughly enjoyed The Extraordinary Life of AA Milne. Great book. Huge Disney fan. Loved learning about A A Milne and his fascination with teddy bears. Altogether an interesting look at a very special family. Wow! Thanks so very much to Netgalley, Pen and Sword and the author, Nadia Cohen, for the opportunity to rave about this book! I loved it and was surprised at how difficult it was to put down. I finished it within 48 hours of starting and that was down to the excellent way the book is put together. It's a fascinating insight into the mind, life and family of this great Author. I didn't realise what a prolific a writer he was (he'd be gutted to know that I knew him solely for his Winnie the Pooh books) and I found his relationships with his wife and son riveting. I also enjoyed the 'Winnie the Pooh' quotes at the beginning of each chapter and the photographs at the end of the book. Just wonderful. 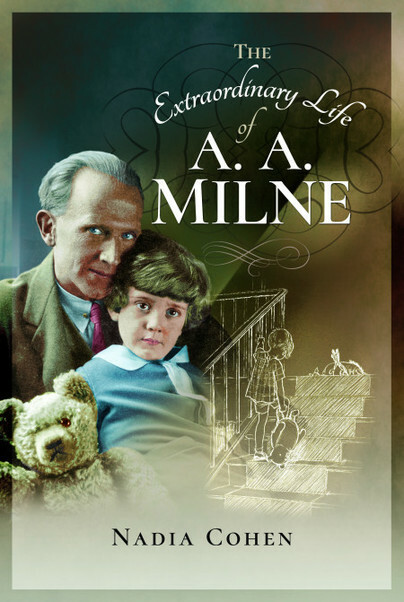 I give The Extraordinary Life Of A.A Milne five out of five stars! Every so often there comes along, a book that you just have to read. The Extraordinary Life of A A Milne is such a book, and if you grew up with the tales of Christopher Robin and Winnie the Pooh, then this book will delight you. This is quite a story, and one that is far away from a fairy tale. A A Milne was a man who was a brilliant writer, but Pooh's success meant that he wasn't quite known for most of his work and he was very resentful of this fact. Even Christopher suffers because of Pooh and I feel that Pooh was some kind of Nemesis for Christopher. I highly recommend this book, as it is a complete dossier of the man we have all heard of. The writing flows brilliant and it's more than a memoir. It is truly quite remarkable.